SOLSC #31 To the month! 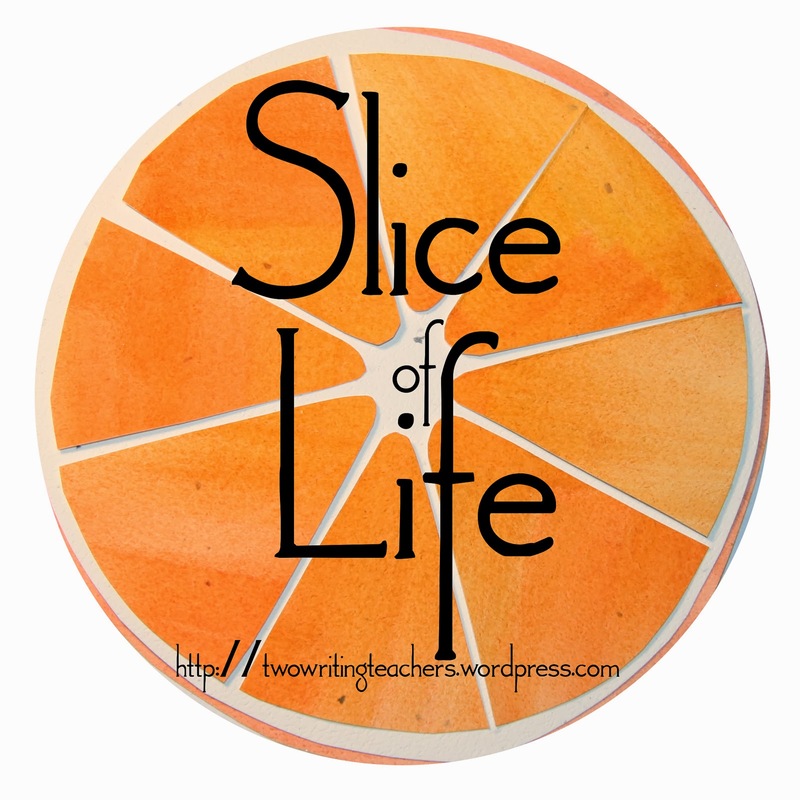 I am posting every day during March as part of the annual "Slice of Life" Challenge for Two Writing Teachers. Check out their website for lots more reflections on teaching. I thoroughly enjoyed this month of blogging. I am surprised and pleased at how I was able to squeeze in writing a post in the midst of my day... I have become an efficient blogger! My only regret is that I didn't get to comment on as many blogs as I had hoped I would; most days I managed just the three comments that we were each expected to offer. I am amazed at the many participants this year, and awed by the writing about teaching. I feel as if I had the pleasure of visiting many different classrooms (and homes!) this month. I plan to take the time to check out new blogs in the days ahead - even if it is already April and the challenge is behind us! A big round of kudos to my colleagues and friends Latisha and Laura, who also took the plunge and blogged this month!! It was so, so fabulous to share the experience with you both. Congrats to one and all on a great month! Thank you, Two Writing Teachers - this was awesome! 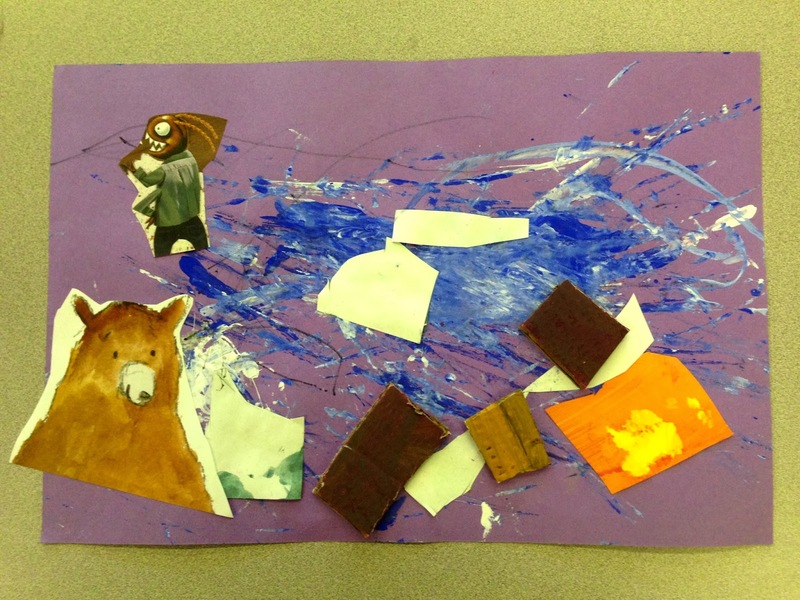 How can I not share something from the preschoolers? 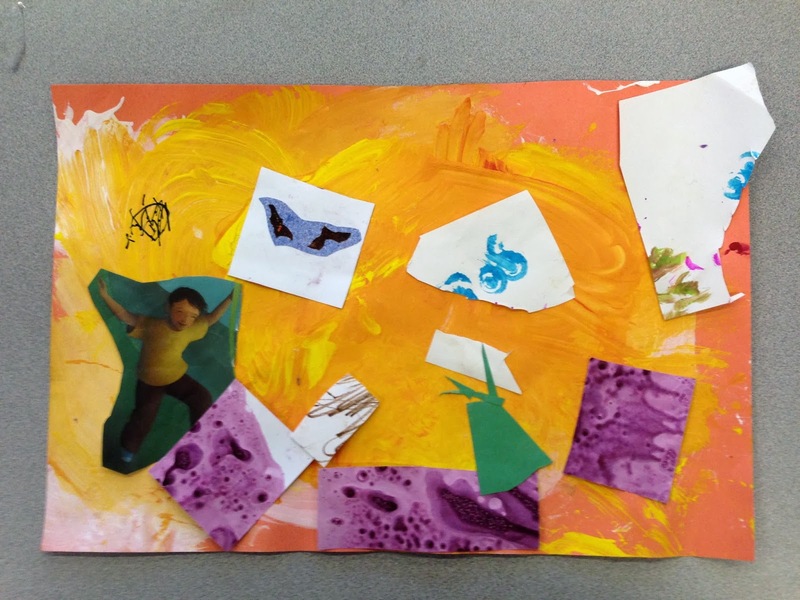 Check out these art pieces by one of my students - left behind, forgotten, not that important to him. I found them at the end of the day. I find them fascinating in their precision, in their similarity. Whether painting or drawing, he is clear about his intentions. I'm pretty sure I know which student is the artist. I am filled with wonder - what is he thinking about? resident of a homeless shelter. when my phone received an Amber Alert. They believe her to be in the company of a "51-year-old janitor [at the shelter] Kahlik Malik Tatum." She was last seen alive around March 1st. The Amber Alert came out on March 20th. 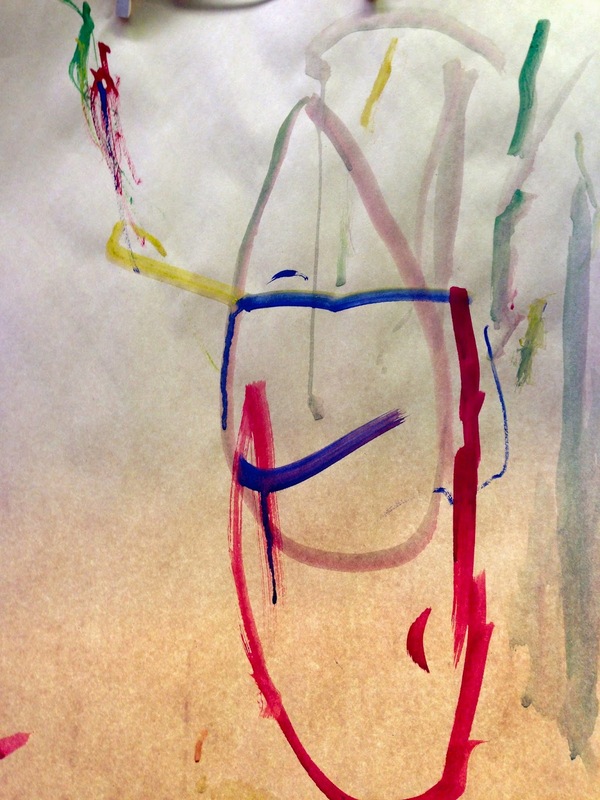 What is community, when a child is invisible? When it takes three weeks to notice she is gone? What is community, when neither school nor shelter report this child's absence, for many days? 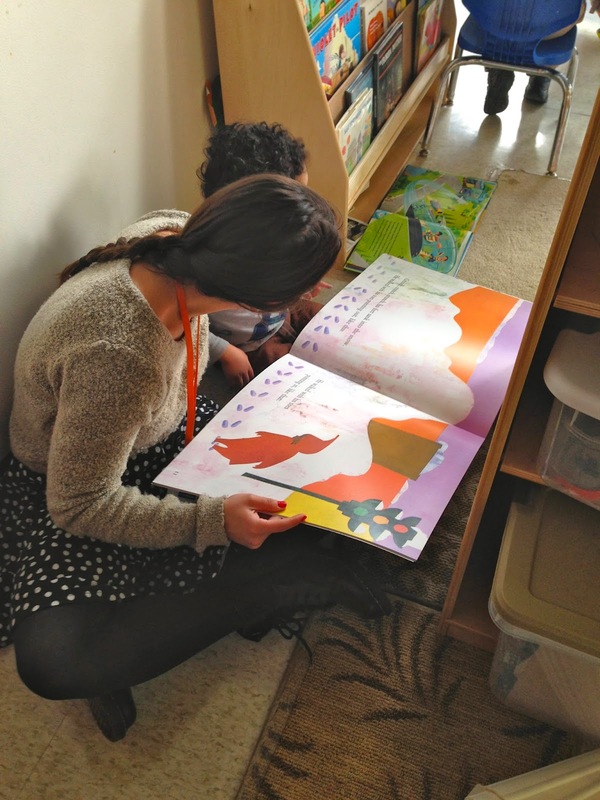 What is community, when there are more than 500 children in our local homeless shelters? In our nation's capital? What is community, when I have to search into the depths of the local paper to find any mention of her? - send them to the printer ... whoops, they all skewed at once - where? to what printer? All of a sudden, I am holding a child's report card, but the envelope it requires is already sealed. Whose report card is in the sealed envelope? Continue more tentatively...not sealing any more envelopes...I match the remaining report cards to envelopes. All report cards processed, I had 3 empty envelopes and one child's report that matches an already sealed envelope. open the already sealed envelope for the one child's report that is outstanding. Voila - it has a child's report for an empty envelope. Why are there 2 empty envelopes? Melissa and I begin squishing all the sealed envelopes - are any thicker than the others? Did I stuff two reports into one envelope? we reprint the two reports to fill the remaining envelopes. Then, we turned them in. Making our deadline - yes, report cards completed by end of day. Perhaps a couple of families will read their child's report plus that of another? I made a real mess of things, that's what! maybe I just came up with a clever way for families to get to know each other better? "I don't want you to choke. I keep you safe," I whispered. "I don't want you to take it," she cried. "Just during nap. Then you will have it back," I explained, and I slipped the barrette ... where? near the sign out sheet? No idea. Didn't give it another thought. Things I do that I hardly give another thought. Ah, but she gave it lots more thought. when she cried about how I had kept her barrette. "Please may I have my barrette back? I am not going to put it in my mouth anymore." very small but important object. "Yellow is my favorite color," she cried. All my usual places for lost, mis-placed, "hold-for-awhile"objects. "Would you write me a note, so that I remember to look for your yellow barrette?" I asked. SOLSC #27 Abiyoyo meets some engineers! A great day! 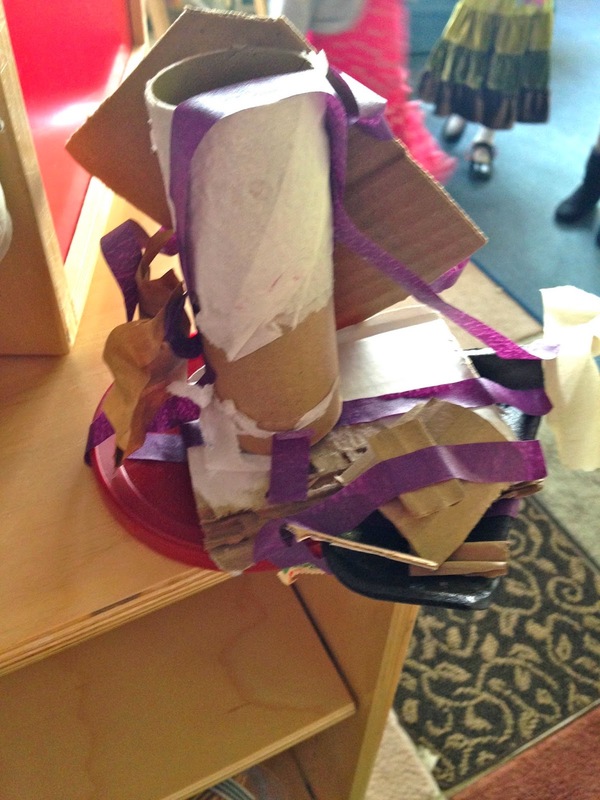 We explored engineering for Pete Seeger's Abiyoyo...this story is a big hit with the children, and they threw themselves into creating devices that could stand up to this big giant! Problem: Abiyoyo scares everyone away. How to Solve? Make something that is not afraid of Abiyoyo. Test: Place device on table. Have student bang table with hands – see if device falls over. Ashley – a store for Abiyoyo – I don’t know why! 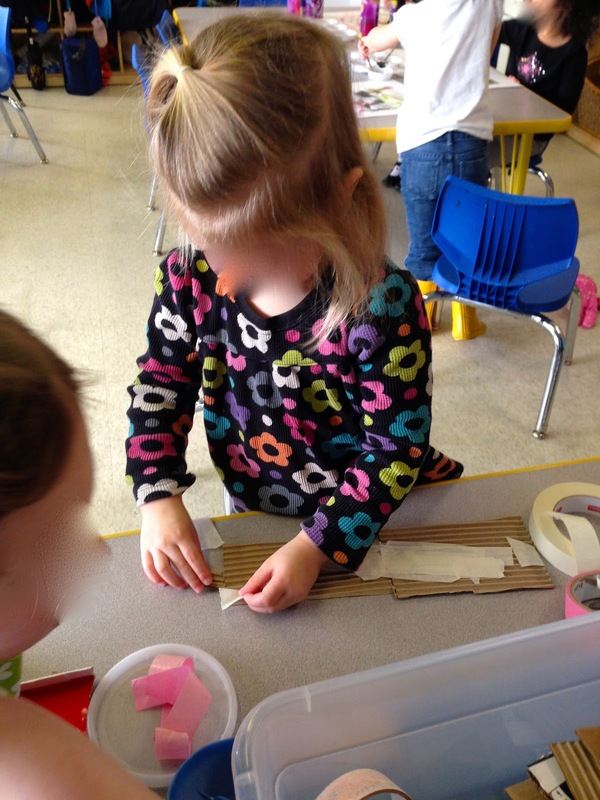 Caroline – I’m making a trap for Abiyoyo – a trap and a sled. I catch him in the net, where the trunk is. Ian – this is Batman movie. Abiyoyo will be scared. I will have to let you know how the engineering test goes - we never got to this part of the fun, today! There was too much building and creativity happening with the devices. Too much creativity was the very best problem of the day! Is it considered a "post" if one only shares a photo? the moment I returned home. I am so thankful that we have school today! No disruption to our routines. I am a little tired of all the snow we have had this year. For the children, however, it continues to be delightful. We watched the snow fall as we played in the classroom. and all the while it snowed. We read The Snowy Day, for the umpteenth time this school year! We went out for a walk in the snow - oh, how lovely! The shady sidewalk had a slight covering of snow, maybe an inch. Look, if you open your mouth, you can catch snow and eat! Look, we can make footsteps just like Peter in The Snowy Day! Look, we can make a snowball! Can I throw a snowball? I can throw it on the ground. Look, there is a lot of snow coming from the sky! Look, there is a lot of snow on the cars! On the construction! On the backhoe! Look, there is snow falling on my face! Look, there is snow on my mittens! Look, I am slipping in my boots! Ha! We peeked at the snow falling as we settled in for our nap. We watched the snow as we ate snack and had our closing. though an inch or two rests on shady spots, on bushes, on grass, on cars. It's not much of a snow. But it was the very best of snows. It appears that we may have our first five day school week in who knows how long. I am so thankful that we had school today! on a bright, sunny, though somewhat crispy, cold day. I thought the fresh air would do us all some good). who didn't care how their words and actions affected the rest of us. Child One [refusing to zip up his coat or put on his gloves from his pocket] - I am cold. I am cold. I am cold. I am cold. I am cold. I am cold. I am cold. I am cold. I am cold. I am cold. Child Two [pulling the walking rope to stop the entire line of classmates] - I don't want to walk this far and I am not going to. I don't want to walk this far and I am not going to. I don't want to walk this far and I am not going to. I don't want to walk this far and I am not going to. I don't want to walk this far and I am not going to. Child Three [walking backwards]-Why are you saying that? Why are you saying that? Why are you saying that? Why are you saying that? Why are you saying that? Why are you saying that? Why are you saying that? 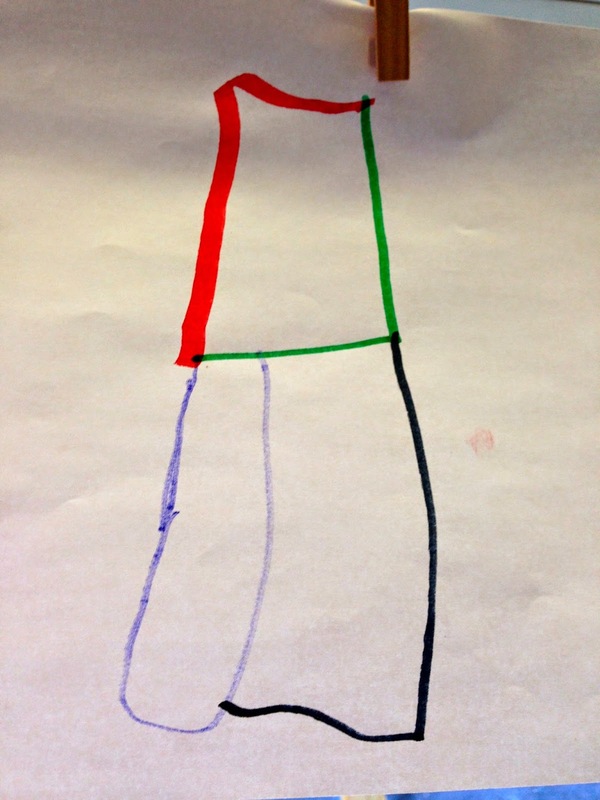 To know me is to know that I believe in play, exploration, and social-emotional learning in preschool, opportunities for children to learn and enjoy being together. Do families realize how much true academic work is happening alongside all this play? Do they believe that social-emotional learning is emphasized at the expense of academics? leads to richer, deeper, stronger early literacy and mathematics learning. 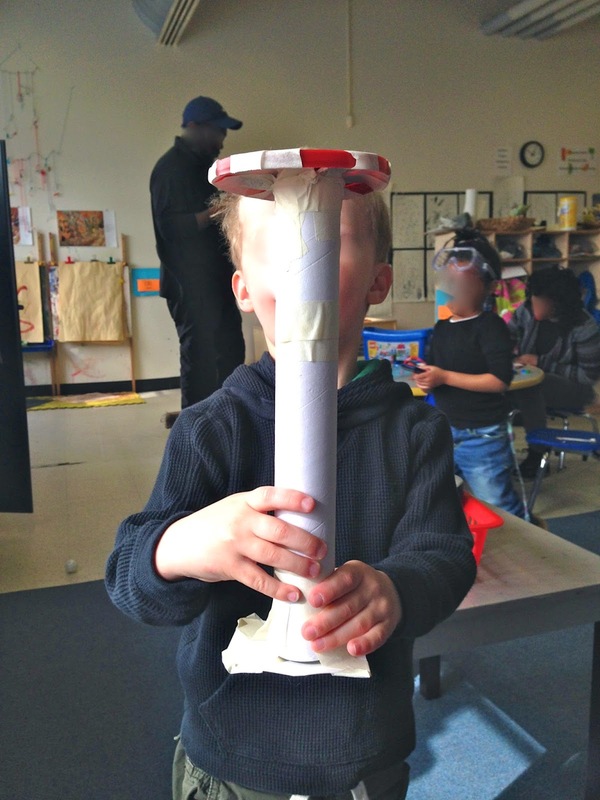 Play is the very best way to teach preschoolers anything and everything! a boy, playing with playdough and counting bears, building a large boat for the bears. He calls to me, "Ms. Ingram, look! I have 14 bears on this boat!" Me - "Fourteen? Wow, that is a lot of bears! How do you know there are 14?" And he proceeds to count the bears trapped in his playdough boat, one-by-one. "Is the numeral 14 here? Which numeral matches how many bears are on your boat?" He studies these and chooses "10." "Do those dots add up to the same number of bears on your boat? Is it the same total?" "No, that's not right. It is more." He puts the card down and grabs the "14" - "See, this one, this one is right." Then he counts the dots on the 14 card to be sure. Me - "Wow. That is a lot of bears! And you are right, that is the numeral 14. You have matched the numeral to your quantity." "Now I am going to have more bears on my boat!," he declares and begins to throw in additional bears and get back to his play, bears in the boat. All of this takes a matter of moments. I have intentionally woven math opportunities into the play. At the beginning of the school year, according to my baseline data, this young child wasn't recognizing any numerals. He was not able to identify quantities for three objects, let alone fourteen. - how many kids are at that table? - how many children are absent? - how many dress ups do we have? who is playing family with you and how many is that? - what blocks will you use to make that bigger? what can you tell me about your design's shape? - "let's make a number line for our classroom!" - what will you do next? what did you do before? - how can you make a bigger firetruck? how much bigger does it need to be? - is this the same or different? how is it different? - who is first? who is second? - how many people are in your picture? - is she taller or shorter than you? - will this container hold more sand than your container? or less? - how many napkins will we need for everyone? the academic learning is profuse and genuine. This is a story for my Mom. The sun is on top and everyone is warm. 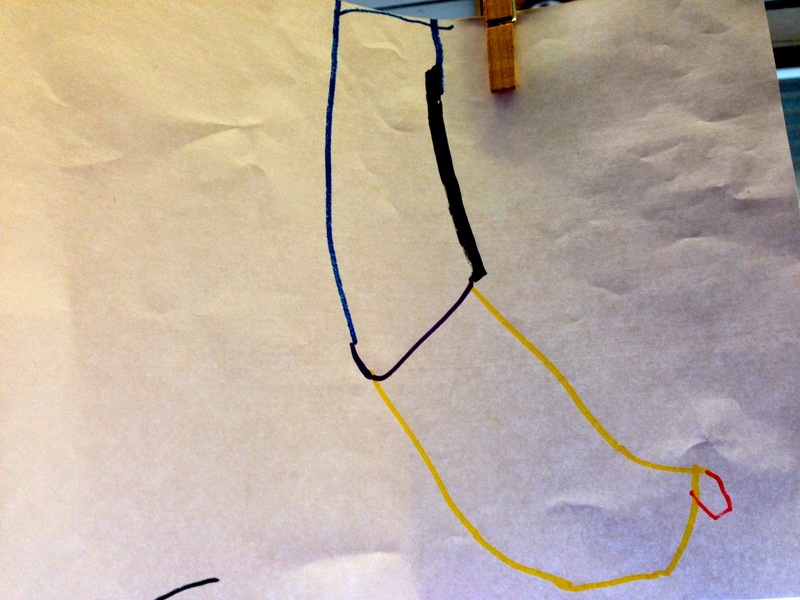 Ezra Jack Keats is there and Julian was there and he is jumping on something, a special jump rope. There was a mommy of somebody. The bats fly away and they try to get all the vegetables. When the kids get too sweaty, they go back inside. And they have chocolate milk and Ezra Jack Keats and Julian go to school. Mommy goes to work, she never goes back to school. The End. SOLSC #1 The challenge begins for my third time! SOLSC #2 There's no such thing as "end"
SOLSC #4 May I work with a few? SOLSC #5 Do you need my help? SOLSC #8 What is community? SOLSC #9 Coincidence or calculated? SOLSC #11 What are you supposed to say? SOLSC #20 Let's make a light tunnel!